Condition is Used. Hasselblad A12 Back. Hasselblad 503 CX Body. Hasselblad Waist Level Finder. Hasselblad Acute Matte Focusing Screen. Hasselblad Clear Filter. The above images are of the actual item. No local pick up. The rubber on the bottom of the body is torn up. With Lens and Film Back. It is against the law. It's normally faster, but lets play it on the safe side! We CAN NOT mark your item as GIFT. We cater to all photographers from the amateur to professional. Coupled with the wide variety of available Carl Zeiss Hasselblad lenses you can achieve film or digital images with exceptional clarity, great contrast and breathtaking beauty. Each piece of this system is fully functional and performing normally. Hasselblad 503cx camera outfit w/80mm f/2.8 Planar CF lens & A-12 back & prism. Serial #11EV16187. No dings or dents. Few marks around on this black 503cx. Clean viewfinder, with standard focusing screen. Smooth film advance with the rapid winding knob. All functions are in good working order. 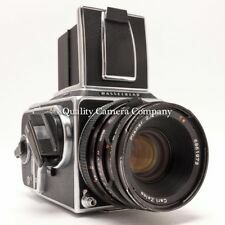 5 out of 5 stars - Hasselblad 503cx camera outfit w/80mm f/2.8 Planar CF lens & A-12 back & prism. 5 product ratings5 product ratings - Hasselblad 503cx camera outfit w/80mm f/2.8 Planar CF lens & A-12 back & prism. Up for sale, a Hasselblad 503CX body with 12 exposure back, lens, and finder. Body and back are quite clean and look to be in good working order. The nose wobbles slightly. Functionally, works okay, you can load film and go to town with it, shutter sounds good, etc. Coupled with any of Carl Zeiss Hasselblad lenses one can achieve portraits with clarity and beautiful tones. Lens MountHasselblad C, Hasselblad CB, Hasselblad CF, Hasselblad CFE, Hasselblad Cfi. This is a used Hasselblad 503CX that is in Excellent Condition. 1 - Hasselblad front body cap. 1 - Hasselblad rear body cap. The grip is clean and fully attached around the body. The waist-level finder and focusing screen are in good shape. Hasselblad 503CX. It basically works. The optics may usually have fog and/or. Body Serial No,11EV14705 / Magazine Serial No,30EV24068. 70-79% of original condition. It may have dents, dings and/or brassing. HASSELBLAD 503CX MINT CONDITION. Well, it has been in my closet for 2 years now and I haven't even looked at it in great depth. I was told his health took a turn for the worst and.well, it wasn't used much. The lens case has minor scuffs from general use, but the lenses are clean and scratch free with no visible defects. The flash unit and trigger are in new condition. Hasselblad Winding Crank for 500C 500CM 503CX. This is appears to have never been used as shown. This will not fit 503cw. [AB- Excellent] Pre-owned, with tiny signs of use. Strap, Body cap, Spirit level, WL finder, Screen, A12 film back. Serial No. : Body 11EV16042 / Back UP420946. [AB Excellent ] Pre-owned, minimal signs of use. Hasselblad 503CX 1941-1991 50th Anniversary. ＋ Lens Shade Pro 40676. Body : Few minor scratch on bottom and viewfinder scope. Viewfinder scope : A little stain. Body Cap / Lens shade. Lens shade : A little scratch. Genuine Hasselblad Film Winding Knob Crank for 500C 500CM 503CX. Condition is very nice. A12 Holder. · Lens glass and mount is good - No Fungus, Haze, Scratch. ( See Photo ). Condition / Check. · All functions operate properly. Zeiss Planar CF 80mm f2.8 lens glass is clean without scratches, fungus and haze. 503 CX body in fully working oreder. Battery type 6V - PX28(in manual, old style and not easy find and expensive) or the equivalent modern type and cheap, easy find 4LR44. MINT IN BOX . Small scuffs from normal use. ■ Appearance. It works properly. I send a product by EMS. ・Hasselblad 503CX Body ,A12 film back,strap. ・Hasselblad CF 80mm f2.8 ,front cap,filter,hood. ・Film back Serial_No:30EV28378. ・ Overall Condition:Rare Near Mint. ・Fully Tested and perfect working order. Carl Zeiss Makro-Planar CF 4/120mm lens is optimized for the macro range, where it is exceptionally sharp, also great for shooting portraits (soft at infinity). A12 Filmback. - Shutter fires at all speed and sound very nice! - All buttons and dials move smooth. - Film advance works smooth. - Body Cap. - There is a little dust in the finder that does not affect image quality. There is the repair history of leather covering over the whole body. There is no separation. It works properly. ■ Functional. I send a product by EMS. ■ Bundled Item. There is no separation. There is no scratches. I send a product by EMS. Focusing Screen: Clean & clear. work properly. 503CX: RE1428779. ■Screen Optics Beautiful condition. There is no separation. No Palpas Crack. Waist Level Finder (Late Model). Sprit Level. ■ Total Condition. Fully operational and functional as intended. [Excellent] Hasselblad 503CX Black C 80mm f/2.8 T Lens A12 Film Back From Japan #18190. Film Holder UP 428361. Body 11ES11214. We solve all issues by consultation. Including As show in the pictures. A12 Filmback. - All buttons and dials move smooth. - Film advance works smooth. ◆ Grade: Near MINT. - Aperture blades open and close as intended. It shows a little sign from normal use. Excellent ! We clean every product carefully and confirm the function by loading a film and taking photo. The product inspects it carefully one by one. The state is superior as used goods. Condition Grade Excellent . Body w/ front cap(no rear cap). Optical Condition. Hasselblad 503CX A12 Planar T CF 80mm F2.8 Lens. A12 type2 Film Back. Planar T CF 80mm F2.8 Lens. 【NEAR MINT】. From JAPAN. tiny scuffs from normal use. It works properly. Appperance is beautiful. Viewfinder Condition No scratches,No fungus,No haze. There are few dust in the viewfinder. It doesn't disturb a view. Lens Condition -. The state is superior as used goods. Condition Grade Excellent. A12 III Film Back. There is nobalsam separation. Film Back:30ES10647. Waist Level Finder ( Late Model). Condition is a personal opinion. Beautiful condition. I send a product by EMS. There is no haze. 【MINT 】Hasselblad 503CX CF Planar T 80mm F2.8 A-12 Type II,III. Hasselblad 503CX CF Planar T 80mm F2.8. Hasselblad Leather Strap. - No marking. - Film Back A-12 Type-III:RR3324916 is a free gift because it is defective. A12 Film back. The finder is clear. LENS SERIAL NO 7390693. Lens Front cap. The lens is clean, too. The film chamber is clean, too. Shutter speed is normal. slow to high ALL speed OK ! 【ALMOST UNUSED】Hasselblad 503CX Carl Zeiss Planar T 80mm F2.8 Lens Film Back A-12 Strap From JAPAN #1370. Body,Lens,Film Back,Strap,Lens Cap. Lens: 6655241. Film back: 30EP55532. Almost Unused. Grade: Near Mint condition! Body Cap, Strap. I will look it for you. So don't worry about the condition. There is no separation. There are small scratches from the normal use on the whole. Body cap,strap, A-12 Film holder. You'll be able to find a good item from this site. I send a product by EMS. Optics(Finder) . [MINT] Hasselblad 503CX w/CF Planar 80mm F/2.8 T A12 Type III Filmback Strap From JAPAN #00395. Hasselblad 503CX : MINT. 503CX: 11eh21682. CF Planar 80mm f2.8T : MINT. A-12 Type III : 30E161724. Total Condition :MINT. Hasselblad 503cx With Beattie Brightness Enhancing Screen, Boxed! The 503cx is in good working order. With Hasselblad original box, inspection certificate, front and rear cap. Beattieenhancing screen with original box and instruction. A12 Filmback : 30EP44688. Lens, A12 film back & Strap. Lens : 7270104. Above condition is based on my own opinion. Body : 11EH21196. tiny scuffs from normal use. There is no separation. I send a product by EMS. I participate from Japan. So I can provide you the best service. Above condition is based on my own opinion. Rear Lens Cap. Front Lens Cap. ■ Optical system. tiny scuffs from normal use. Lens and Finder. The Hasselblad brand became widely recognized during the 1960s when modified Hasselblad 500E cameras were used during the Apollo lunar missions. Hasselblad's medium-format SLR cameras such as the 503CX continue to be used by professional photographers and amateur hobbyists. eBay offers a multitude of used cameras and camera equipment for the Hasselblad 500 series. What types of photos are medium format cameras meant for? What types of film rolls are compatible with Hasselblad 503CX? Only two types of film rolls are compatible with the Hasselblad 503CX film camera. The sleek Hasselblad 503CX medium-format cameras take 6 x 6 square photo images as opposed to the more common rectangular photos. Both the 120 film format and the 220 film format can be used with the Hasselblad 503CX film cameras that you can find on eBay. 120 Film Format: One 120 film roll can give photographers around 12-13 exposures. 220 Film Format: The 220 film offers the same width as the 120 film but contains double the total film length allowing for almost twice the number of possible exposures. Photographers can expect to take about 24-27 exposures with one 220 film roll. Can the 503CX camera be converted to take digital photography? The only method to take digital photography with vintage medium-format film cameras is to attach a digital camera back into the slot where the traditional film roll holder attaches. The digital back contains an electronic imaging sensor that allows film cameras to take digital photos. There are two types of digital backs: the single shot backs and the scan backs. The Hasselblad 500 series uses the single shot back. With the conversion to digital photography possible, this means that photographers could use one camera to capture both film and digital photography, vastly improving the versatility of a single camera. Content provided for informational purposes only. eBay is not affiliated with or endorsed by Hasselblad.